The Celebration of the Synaxis (Assemblage) of the Leader of the Heavenly Hosts Michael, and the Other Heavenly Bodiless Hosts was established at the beginning of the fourth century at the local Laodician Council, which occurred several years before the First Ecumenical Council. The Angelic Ranks are divided into three Hierarchies: highest, middle, and lowest. In the Highest Hierarchy are included the three Ranks: the Seraphim, Cherubim and Thrones. 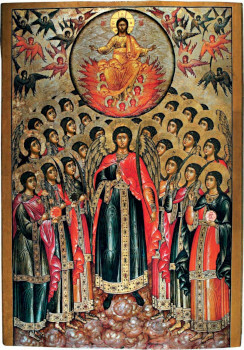 Closest of all to the Most Holy Trinity stand the six-winged Seraphim (Flaming, and Fiery) (Is. 6:12). They blaze with love for God and impel others to it. After the Seraphim there stand before the Lord the many-eyed Cherubim (Gen. 3: 24). Their name means: outpouring of wisdom, enlightenment, since through them, radiating with the light of divine knowledge and understanding of the mysteries of God, there is sent down wisdom and enlightenment for true divine knowledge. After the Cherubim, through grace given them for their service, stand the God-bearing Thrones (Col. 1:16), mysteriously and incomprehensibly upholding God. They serve the uprightness of God’s justice. Dominions (Col. 1:16) hold dominion over the successive ranks of Angels. They instruct the earthly authorities, established from God, to wise governance. The Dominions influence rule by miracles, they quell sinful impulses, subordinate the flesh to the spirit, and provide mastery over the will to conquer temptation. Powers (1 Pet. 3:22) fulfill the will of God. They work the miracles and send down the grace of wonderworking and perspicacity to saints pleasing to God. The Powers give assist to people in bearing obediences, encourage them in patience, and give them spiritual strength and fortitude. Authorities (1 Pet. 3:22, Col. 1:16) have authority to quell the power of the devil. They repel from people demonic temptations, uphold ascetics and guard them, helping people in the struggle with evil ponderings. Principalities (Col. 1:16) have command over the lower angels, instructing them in the fulfilling of Divine commands. To them are entrusted to direct the universe, and protect lands, nations and peoples. Principalities instruct people to render honour to everyone, as becomes their station. They teach those in authority to fulfill their necessary obligations, not for personal glory and gain, but out of respect for God and benefit for neighbour. Archangels (1 Thess. 4:16) announce about the great and most holy, they reveal the mysteries of the faith, prophecy and understanding of the will of God, they intensify deep faith in people, enlightening their minds with the light of the Holy Gospel. Angels (1 Pet. 3:22) are closest to all to people. They proclaim the intent of God, guiding people to virtuous and holy life. They protect believers restraining them from falling, and they raise up the fallen; never do they abandon us and always they are prepared to help us, if we so desire. All the Ranks of the Heavenly Powers have in common the name Angels by virtue of their service. The Lord reveals His will to the highest of the Angels, and they in turn inform the others. Over all the Nine Ranks, the Lord put the Holy Leader (“Archistrategos”) Michael (his name in translation from the Hebrew means “who is like unto God”), a faithful servitor of God, wherein he hurled down from Heaven the arrogantly proud day‑star Lucifer together with the other fallen spirits. And to the remaining Angelic powers he cried out: “Let us attend! Let us stand aright before our Creator and not ponder that which is displeasing unto God!” According to Church tradition, in the church service to the Archistrategos Michael concerning him, he participated in many other Old Testament events. During the time of the Exodus of the Israelites from Egypt he went before them in the form of a pillar of cloud by day and a pillar of fire by night. Through him the power of the Lord was made manifest, annihilating the Egyptians and Pharaoh who were in pursuit of the Israelites. The Archangel Michael defended Israel in all its misfortunes. He appeared to Jesus Son of Navin (Joshua) and revealed the will of the Lord at the taking of Jericho (Josh. 5:13-16). The power of the great Archistrategos of God was manifest in the annihilation of the 185 thousand soldiers of the Assyrian emperor Sennacherib (4 Kings 19:35); also in the smiting of the impious leader Antiochos Illiodoros; and in the protecting from fire of the Three Holy Youths – Ananias, Azarias, and Misail, thrown into the fiery furnace for their refusal to worship an idol (Dan. 3:22‑25). From Sacred Scripture and Sacred Tradition are likewise known the Archangels: Gabriel – strength (power) of God, herald and servitor of Divine almightiness (Dan. 8:16, Lk. 1:26); Raphael – the healing of God, the curer of human infirmities (Tobit 3:16, 12:15); Uriel – the fire or light of God, enlightener (3 Ezdras 5:20); Selaphiel – the prayer of God, impelling to prayer (3 Ezdras 5:16); Jehudiel – the glorifying of God, encouraging exertion for the glory of the Lord and interceding about the reward of efforts; Barachiel – distributor of the blessing of God for good deeds, entreating the mercy of God for people; Jeremiel – the raising up to God (3 Ezdras 4:36). Michael – tramples the devil underfoot, and in his left hand holds a green date-tree branch, and in his right hand a spear with a white banner (or sometimes a fiery sword), on which is outlined a scarlet cross. Gabriel – with a branch from paradise, presented by him to the Most Holy Virgin, or with a shining lantern in his right hand and with a mirror made of jasper in his left. Uriel – in raised right hand hold a bare sword at the level of his chest, and in his lowered left hand “a fiery flame”. Jehudiel – in his right hand holds a golden crown, in his left a whip of three red (or black) branches.